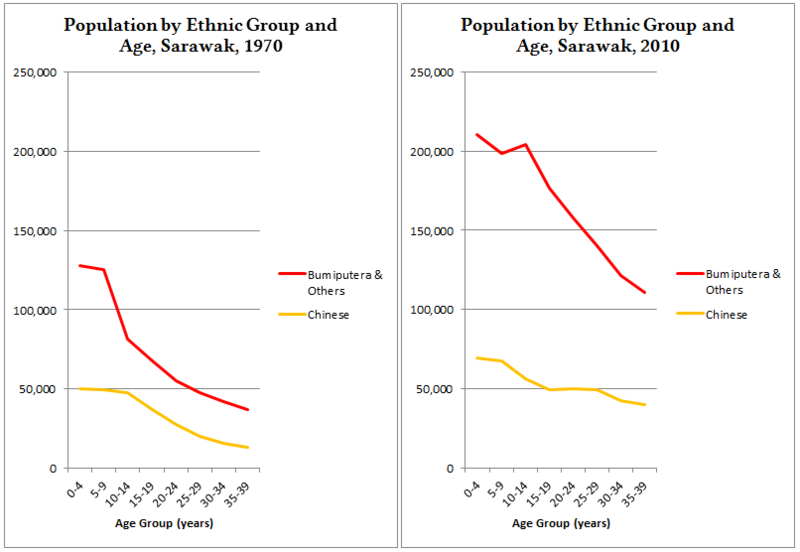 The 2 graphs below show the gap between ethnic groups in Sarawak by age in 1970 and 2010, from ages 0 – 39 years. This was taken from the National Census. 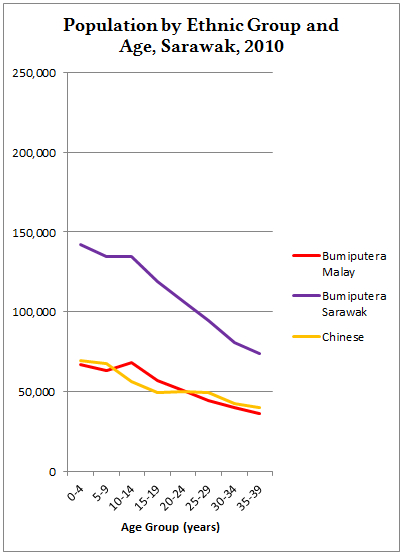 The top-most line (red) represents Malays, followed by Chinese (yellow), Other Bumiputera (purple) and Indians (blue). Both graphs use the same scale. Compared to 1970 there are more non-Chinese youth in 2010 relative to Chinese youth. In our previous report on Pakatan Rakyat’s performance with the Malay electorate in Peninsular Malaysia, we highlighted that the Malay population and electorate are increasing faster compared to other ethnic groups. 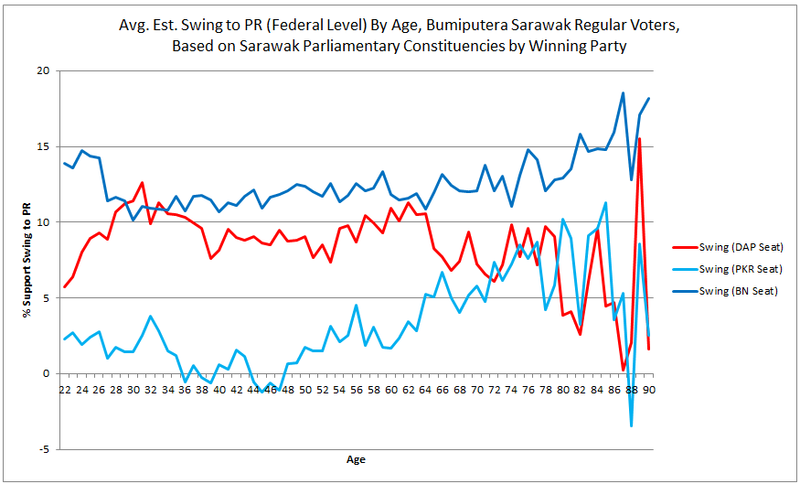 In Sarawak the higher numbers of young Bumiputera Sarawak citizens compared to other ethnicities implies that Bumiputera Sarawak voters will remain the dominant group in the electorate in future elections. This is assuming that voter registration rates across ethnicities remain constant. 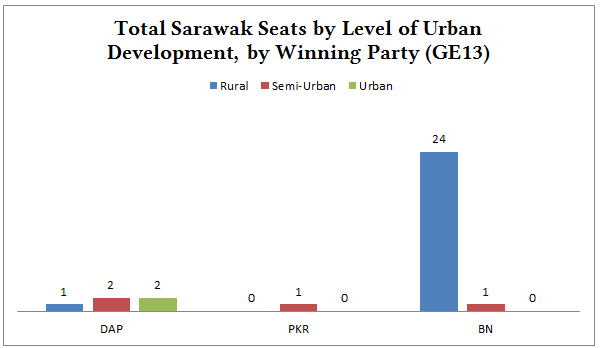 By comparing the two sets of data it is clear that BN won the most rural seats and have the most Malay voters (86.7% of the total regular Malay voters) and Bumiputera Sarawak voters (86.1% of the total regular Bumiputera Sarawak voters) in their seats. DAP have the most Chinese voters in their seats (62.5% of the total regular Chinese voters). 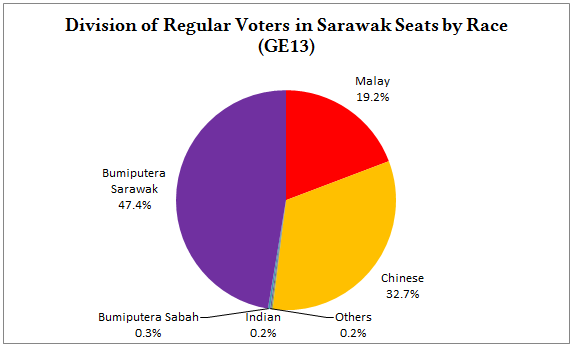 From the ethnic total of 503,111 regular voters, 81.5% of Bumiputera Sarawak voters reside in Rural seats; 15.9% in Semi-Urban seats and 2.6% in Urban seats. From the ethnic total of 204,298 regular voters, 85% of Malay voters reside in Rural seats; 11.1% in Semi-Urban seats and 3.9% in Urban seats. From the ethnic total of 347,607 regular voters, 32.8% of Chinese voters reside in Rural seats; 35.4% in Semi-Urban seats and 31.8% in Urban seats. Chinese voters are almost evenly distributed between the 3 categories of seats. DAP and PKR victories were won mainly in urban and semi-urban seats. PR parties won both urban seats and 4/5 semi-urban seats. 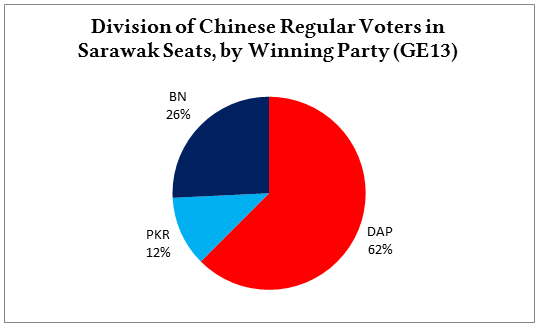 Together these 6 seats contain 62.4% of Chinese voters; 13% of Malay voters; and 13.9% of Bumiputera Sarawak voters. This section is a general overview that shows the size of the electorate represented by each party. However representation is not the same as support, as each seat has supporters of both PR and BN. Support is covered in the following sections. During the election voters are grouped into polling lanes based on age. The results of each lane are reflective of support by the age group. By mapping registered voters to polling lane results we can estimate the support by race and age. Postal voting lanes are not shown in the charts. Not all lanes are of equal size. Each point in the graph represents one polling lane. The horizontal scale shows the percentage of Malay voters in the lane. 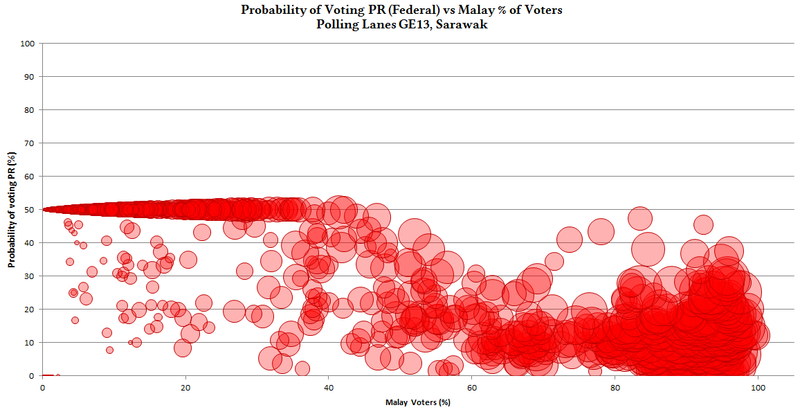 The vertical scale shows the percentage probability of Malay voters in that lane of voting for PR. The size of the bubble is relative to the number of voters with large bubbles representing high numbers of voters. The level of support can be analysed by looking at where the largest circles are concentrated. Any point above the 50% probability line is good for PR. From this scatter plot we can tell that PR does not perform well with Malay voters. Even in fence-sitters in mixed polling lanes the number of voters is small (16% of the total regular Malay voters). 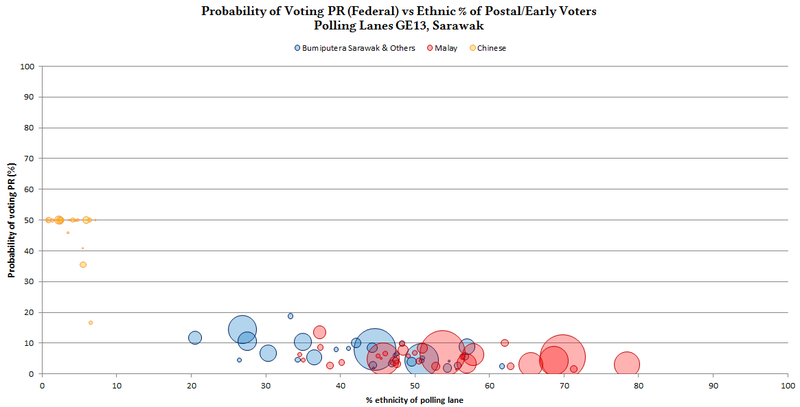 The probability of voting for PR is significantly low in polling lanes with >70% Malay voters. For comparison, here is the bubble chart for Bumiputera Sarawak and voters from other ethnicities (not including Malay or Chinese). Other ethnicities had to be included because of the way our polling lane data was structured in 2013. 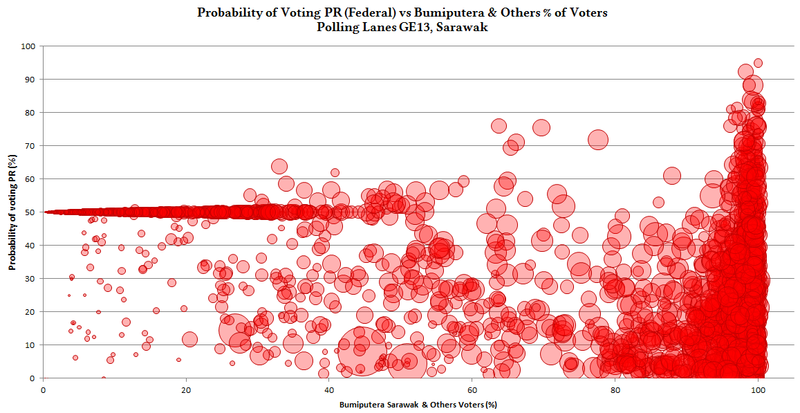 Support for PR is low particularly in the majority of polling lanes where the percentage of Bumiputera Sarawak and other ethnicities is high. There is a clear trend of the probability of Chinese voters voting for PR increasing as the percentage of Chinese voters increase. This bubble chart shows the probabilities for postal and early voters. The probability of postal and early voters voting for PR is very low, almost entirely concentrated below 20%. The only exception was Chinese voters at the 50% line, which were very few in number. The following graph shows how average voter support shifted by age group, divided by seats won by respective parties. This was calculated by taking the average of individual support values from voters across all seats for each age group. This gives a picture of how voters in those seats favoured the winning party. 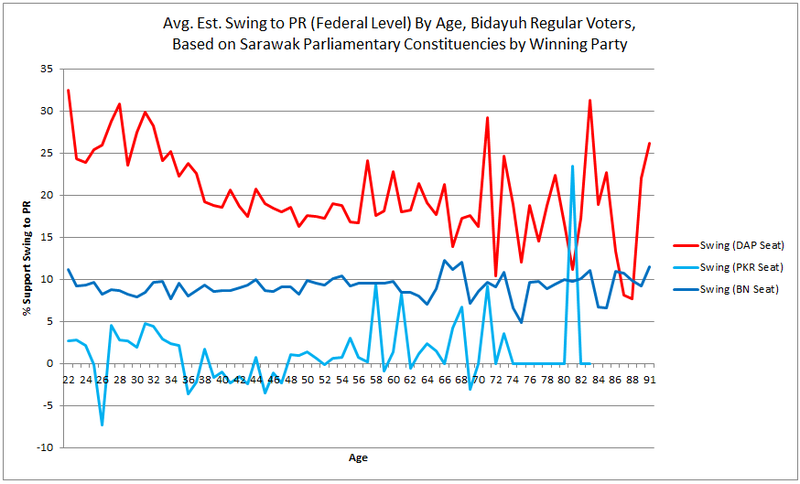 The PKR seat (they only won Miri) had a higher swing from voters aged 33 and below and voters aged 58 – 67. This graph shows the average level of support from voters in seats won by respective parties after the swing in GE13. Anything close to or above 50% is good for PR. 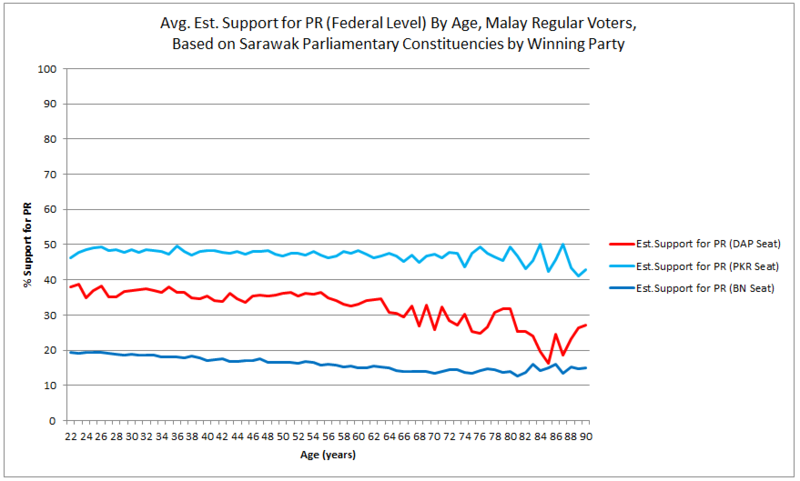 The following graphs show the average shift in voter support by age group and voter support levels for Malay voters. The negative swing in BN seats reflects 87% of Malay voters. 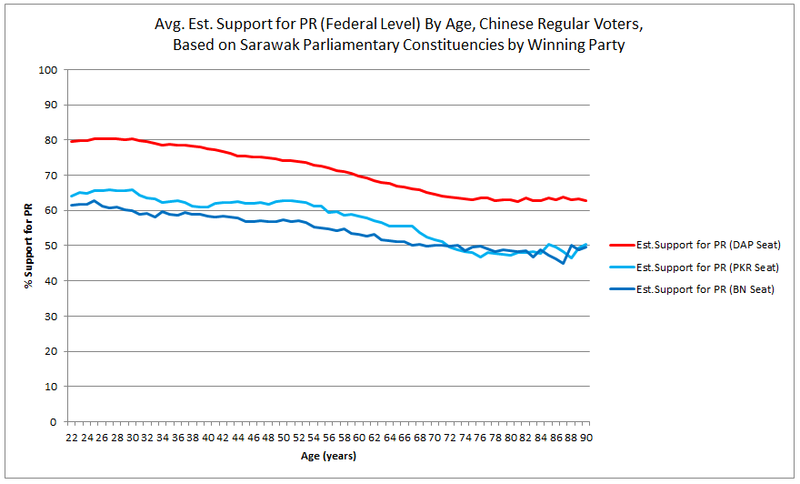 The following graphs show the average shift in voter support by age group and voter support levels for Chinese voters. Support from the Chinese electorate appears reliably strong. 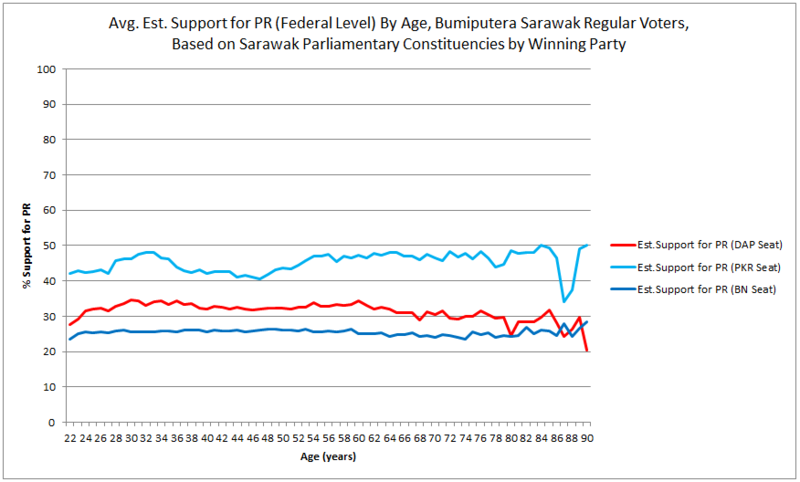 The following graphs show the average shift in voter support by age group and voter support levels for Bumiputera Sarawak voters. 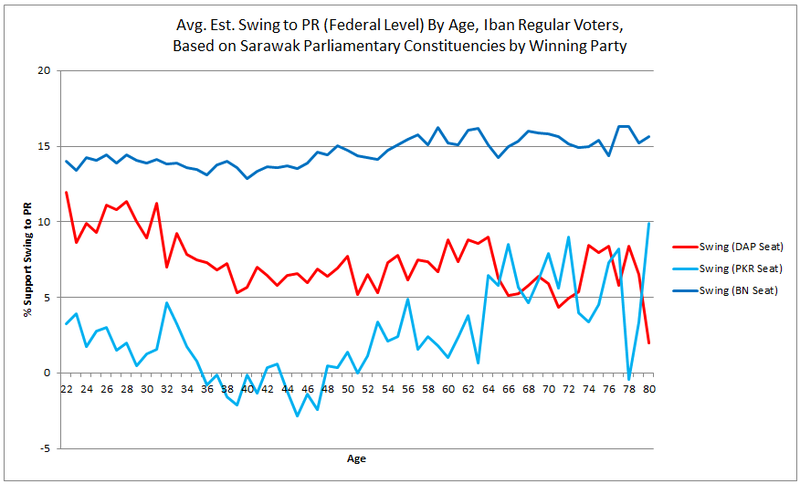 Voters in BN and DAP seats recorded the highest swing levels towards PR, largely between 5% – 10%. BN seats recorded the highest swing values. 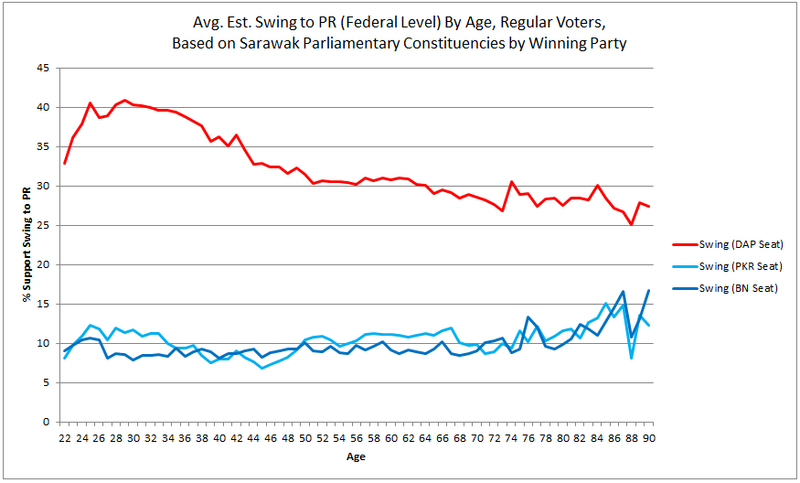 After the swing support for PR was strongest in the PKR seat (Miri) with values between 40% and 50%. Support for PR in DAP and BN seats remains low, between 23% – 33%. Support from the Bumiputera Sarawak electorate appears weak. DAP and PKR may manage to increase their odds by repeating a positive swing of 5% – 15%, but support values in BN seats are very low. 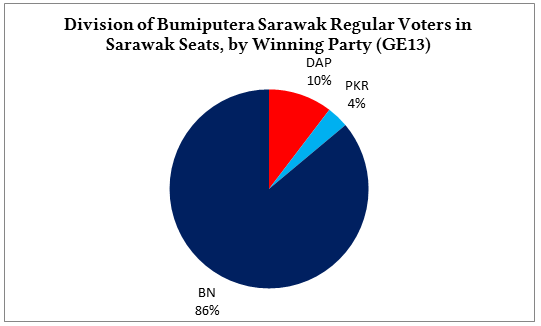 BN seats represent 86% of Bumiputera Sarawak voters. This section describes voter support by age, taken as an average of support across voters within each age group. These graphs do not show the number of voters – a large negative swing from a small group of voters can be easily offset by a small positive swing from a large group of voters. These graphs only serve as an indicator of where average support levels are at and what direction they are heading in. Because averages of positive and negative swing values can results in a net positive or negative, we need to look at individual voter support levels to get a more accurate reading. Because individual voters have their own support and swing statistics, we can calculate the proportion of the electorate that is leaning towards PR (>50% probability of voting PR); leaning towards BN (<50% probability of voting PR); and on the fence (50% probability of voting PR). Voters who are leaning BN might still vote for PR, so this metric is only an indicator of how good the odds are for PR/BN to win support from the electorate. It is important to note that PR did not perform well or contest every seat in GE12, so statistically they were starting from a very weak position. This is why certain swing values are very high. 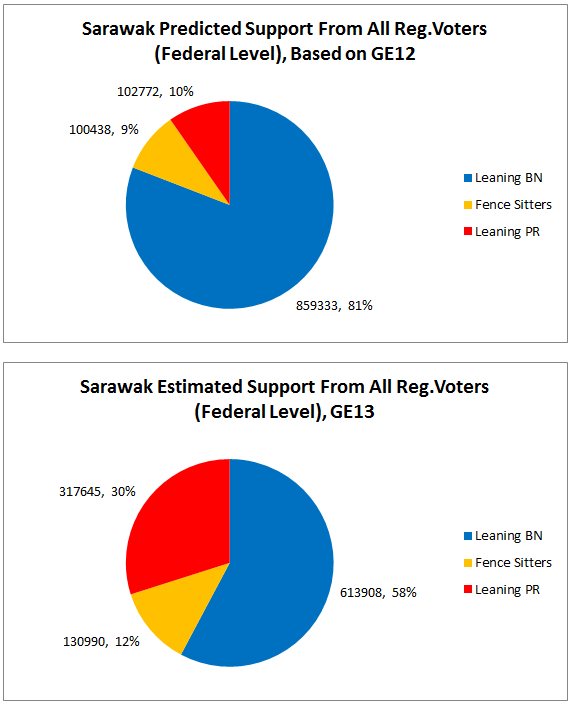 The two charts below show the predicted and estimated support from regular voters in Sarawak. By comparing the two we can see how support has shifted. 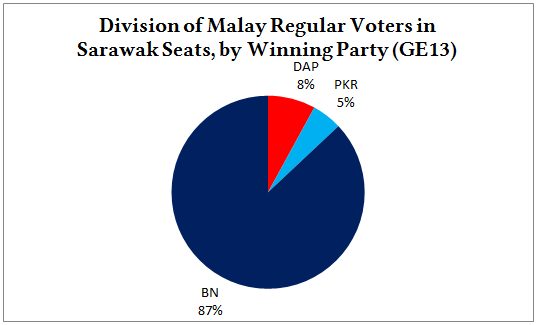 Prior to GE13, the electorate was leaning heavily towards BN with only 10% leaning towards PR. After GE13 PR increased their share of support by 20 percentage points while BN lost 23 percentage points. The proportion of fence-sitters increased to 12%. Based on GE12 results, the predicted support for PR from the Malay electorate was <1%. After GE13 support for PR dropped to 0. Any votes obtained came from the fence sitters. The charts below show voter support from the Bumiputera Sarawak electorate. This does not include other ethnicities (as in the polling lane bubble charts). PR managed to increase their share of support from 2% to 9%. Fence-sitters increased by 3 percentage points while BN supporters dropped by 10 percentage points. The charts below show voter support from the Chinese electorate. The shift in support was quite dramatic due to PR’s poor performance and lack of participation in all seats in GE12. Support for PR increased by 53 percentage points, while support for BN dropped by 55 percentage points. Fence-sitters increased by 2 percentage points. 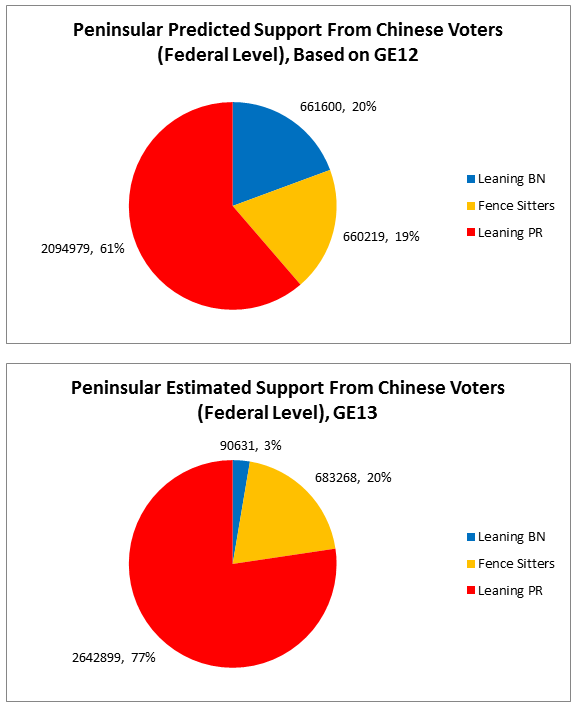 In Peninsular Malaysia the shift in support from Chinese voters was less dramatic with PR gaining 16 percentage points. BN lost 17 percentage points, reducing its share to only 3%. By comparing this with Sarawak we can say that PR has stronger support from Chinese voters in Sarawak at 79% compared to Peninsular Malaysia at 77%. 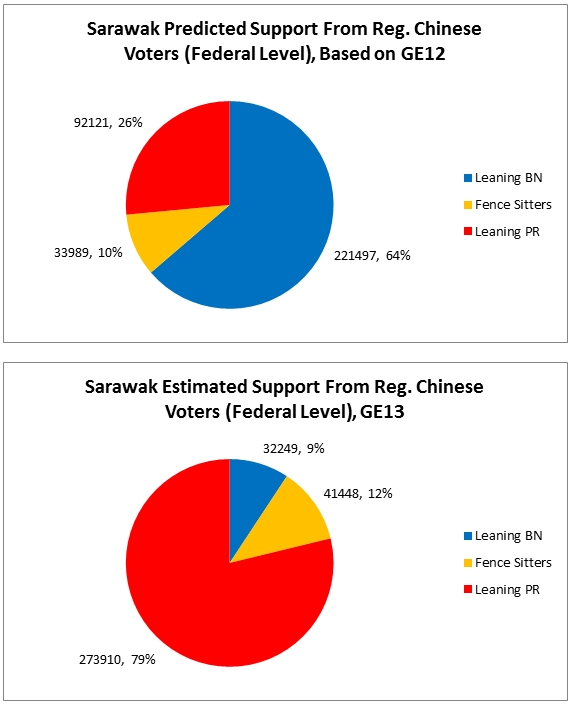 The smaller proportion of fence-sitters (12% for Sarawak versus 20% for Peninsular Malaysia) implies that support from the Chinese electorate is more stable. Based on detailed information on voters we can measure support from Iban and Bidayuh communities. 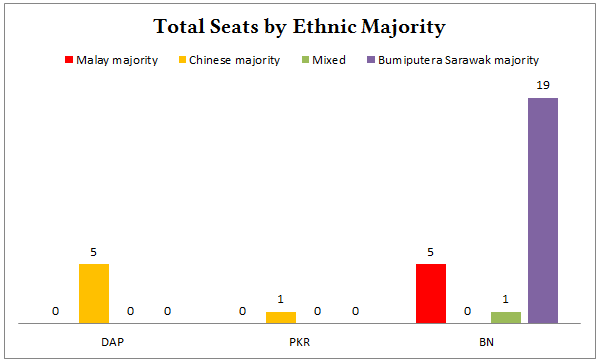 The breakdown of the 503,111 Bumiputera Sarawak voters by ethnicity is listed below. The unknown Bumiputera voters presented a possible issue, however their numbers are spread out across all Sarawak seats. There was no clear pattern to suggest that they are primarily from a single ethnic group. The findings of this section should still apply to Iban majority and Bidayuh majority seats. The table below shows the percentage of Iban and Bidayuh voters in PR and BN seats. 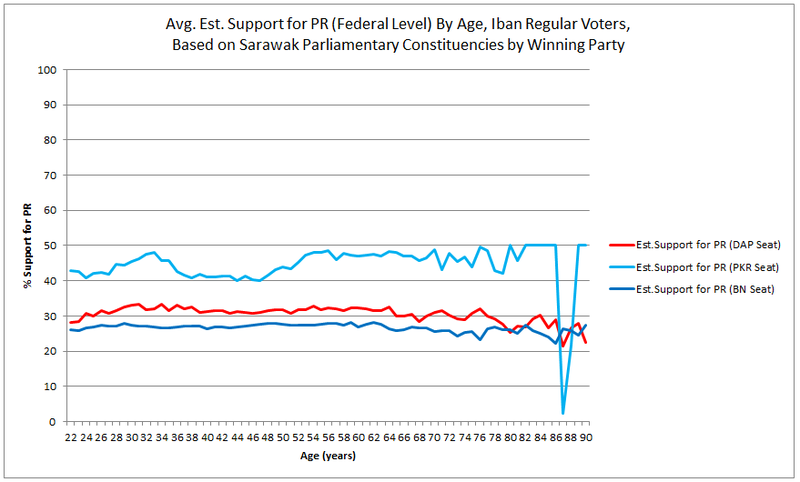 The following graphs show the average shift in voter support by age group and voter support levels for Iban voters. Voters in BN seats had high swing values towards PR, averaging at 15%. 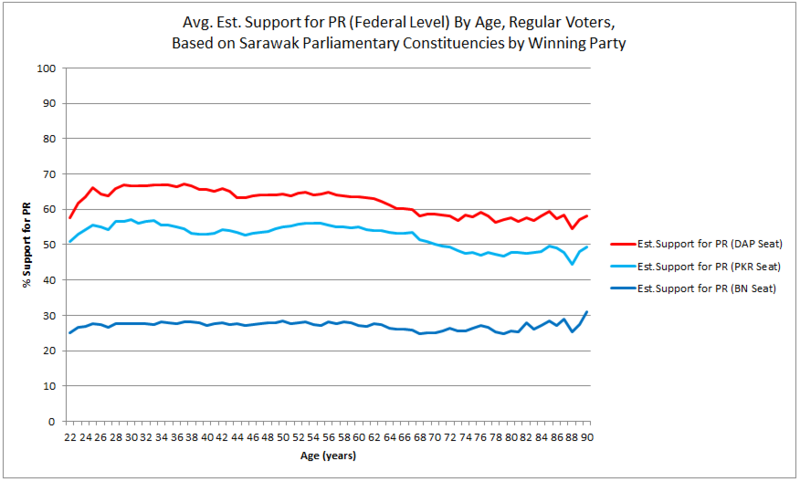 Voters in DAP seats had high swing values towards PR with voters below 34 years old increasing support by 9.24% – 11.93%. Voters in the PKR seat had a marginal swing towards PR other than voters aged 36 – 48 where there was a negative swing of -0.09% to -2.83%. The charts below show voter support from the Iban electorate. 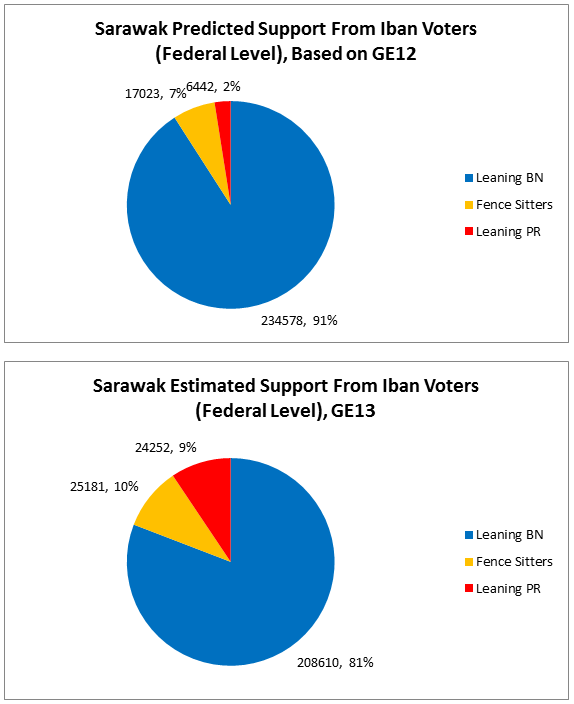 The percentages are identical to the previous Bumiputera Sarawak charts. PR managed to increase their share of support from 2% to 9%. Fence-sitters increased by 3 percentage points while BN supporters dropped by 10 percentage points. 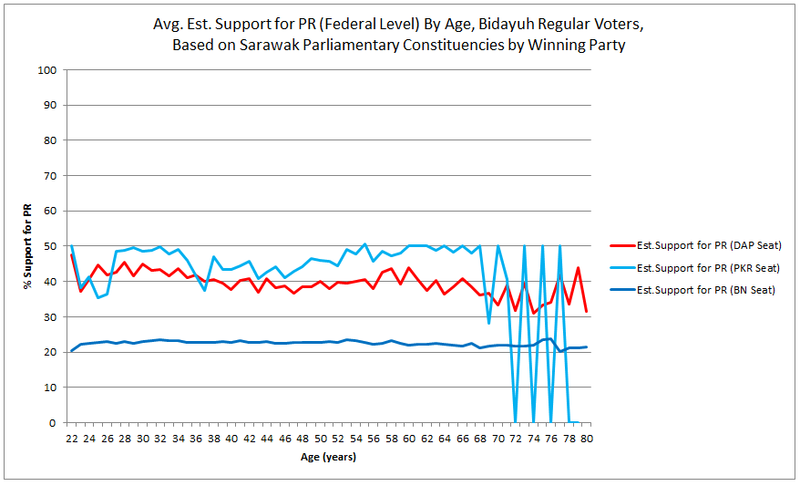 The following graphs show the average shift in voter support by age group and voter support levels for Bidayuh voters. 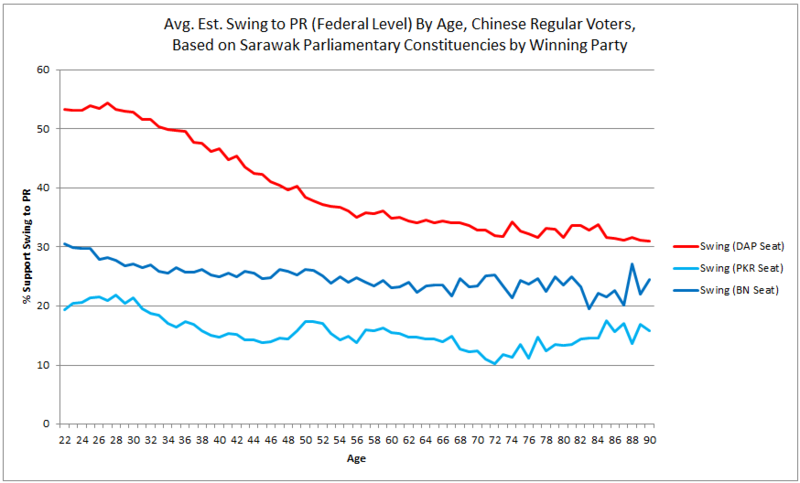 Voters in DAP seats had the highest swing values towards PR with voters below 38 years old increasing support by 22.6% – 32.5%. 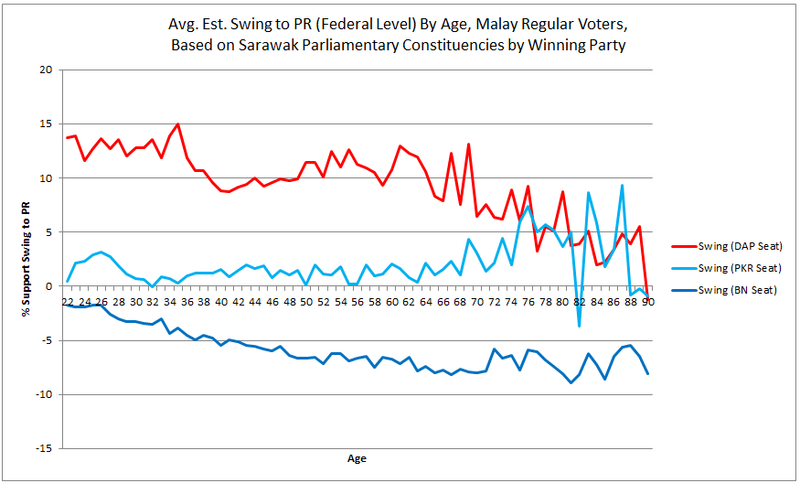 Voters in the PKR seat had a marginal swing towards PR mainly concentrated between ages 27 – 35. There was a negative swing from voters between ages 37 – 48 (except 45 year olds). After the swing support from Bidayuh voters was highest in the PKR seat though still below 50%. Support ranged from 35.4% – 50.7%. Support from Bidayuh voters in BN seats were consistently low at an average of 22%. The charts below show voter support from the Bidayuh electorate. These charts show that despite the better swing values for Bidayuh voters compared to Iban voters, PR actually lost support. This is because voters who swung to PR came more from the Leaning BN group and fence-sitters group, with the shift being too small for them to go over to the Leaning PR group. PR’s share of support was reduced to 1%. Fence-sitters increased by 5 percentage points while BN supporters dropped by 4 percentage points. Because we measure voter support at the individual level, based on where they are registered to vote we can summarise voter support and swing and the State Assembly (DUN) level. This is based on the assumption that the majority of voters would have voted for the same party/coalition for both the State and Federal levels. The following table lists the 71 State Assembly Seats and their support levels for PR in GE13. The list is sorted by the support for PR from highest to lowest. The winning party for each seat in Sarawak’s State Election in 2011 is shown. In the upcoming state election there will be 82 seats instead of 71 so the statistics here will not be directly applicable. It depends on which of the old seats will be divided to create new seats. However based on these numbers it is likely that the Opposition will retain their 15 seats and add 2 more seats – N65.SENADIN and N67.TELANG USAN. Based on the current support levels and swing indicators, the Opposition can hope to win at most 22 seats starting from PADUNGAN to MACHAN in the above list. PR performed poorly with Malay and Bumiputera Sarawak voters. BN won seats containing 87% of Malay voters and 86% of Bumiputera Sarawak voters. Support for PR from Malay voters dropped to the point where zero voters are estimated to be leaning towards PR. The Malay electorate also swung away from PR in seats won by BN. This negative shift was not observed at the same level for other ethnic groups. Support from Bumiputera Sarawak voters only increased by 7 percentage points. Between Iban and Bidayuh voters, PR performed better with Iban voters. However the level of support for PR from voters of both ethnic groups remains low. The urban-rural divide was clearly demonstrated by PR winning all the urban seats and BN winning 24 out of 25 rural seats. The Opposition needs to expand its base into the rural areas. 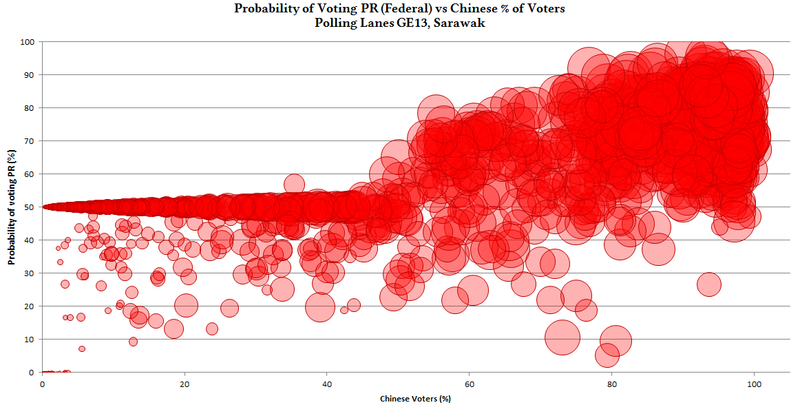 PR performed well with Chinese voters, even better than in Peninsular Malaysia. However PR won all the Chinese-majority seats and 74% of the Chinese electorate are in PR’s constituencies. Campaigns that target the Chinese electorate will not deliver enough seats to form the government. 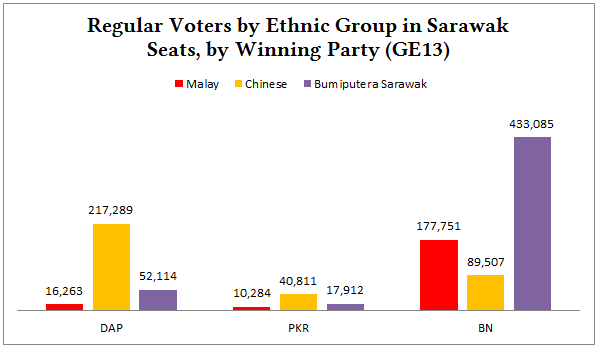 Based on the GE13 results BN remains in a comfortable position with the Malay and Bumiputera Sarawak electorate. The only way for the Opposition (either Pakatan Harapan or another state-level coalition) to win the state is to address the issues that caused the Malay voters and different Bumiputera Sarawak ethnic groups to vote for BN. As mentioned in the previous section the Opposition only stands to win 15 – 22 state seats without a dramatic shift in support.